I have re-enrolled with Amazon Associates. You should see the widget in the right sidebar towards the bottom. If you buy anything from Amazon, you can do so by clicking on the widget. This may be a duplicate of what you have heard on any number of other blogs. It will give me a few pennies on whatever you buy at no cost to you. I also have a Cafe Press Shop: www.cafepress.com/Artquiltmaker. Go buy stuff. Thanks. Audiobook playing on my iPod: Beekeeping for Beginners, novella by Laurie R. King. I haven’t been using much DMC floss lately on the pieces that I embroider. I usually head over the Perl Cotton aisle. Mark Lipinski had a few things to say about a DMC floss color card he bought recently. Definitely Buyer Beware. Weeks Ringle talked recently about elastic thread on her blog. She gives some tips and tricks for working with it. Quick skirt anyone? I had iron drama again recently. I finally got fed up with my iron leaking and went looking for a new one. Target had drastically reduced their choices, which is where I usually buy my irons. Mark Lipinski suggested I get a Digital Velocity iron, so I went looking for one of those. Joann has them online only, but you can’t use their coupons, except for the free shipping coupon and $165 is a lot to pay for an iron. I saw the other day that Bed Bath and Beyond had them also. They are $140 online at BB&B, which is a discount. Again, you can’t use the coupon online and I don’t know if they have them in store. I ended up with a Sunbeam Turbo Steam Master. It feels cheap, but isn’t leaking and has good steam. I’ll keep looking for a good price ont he Digital Velocity. 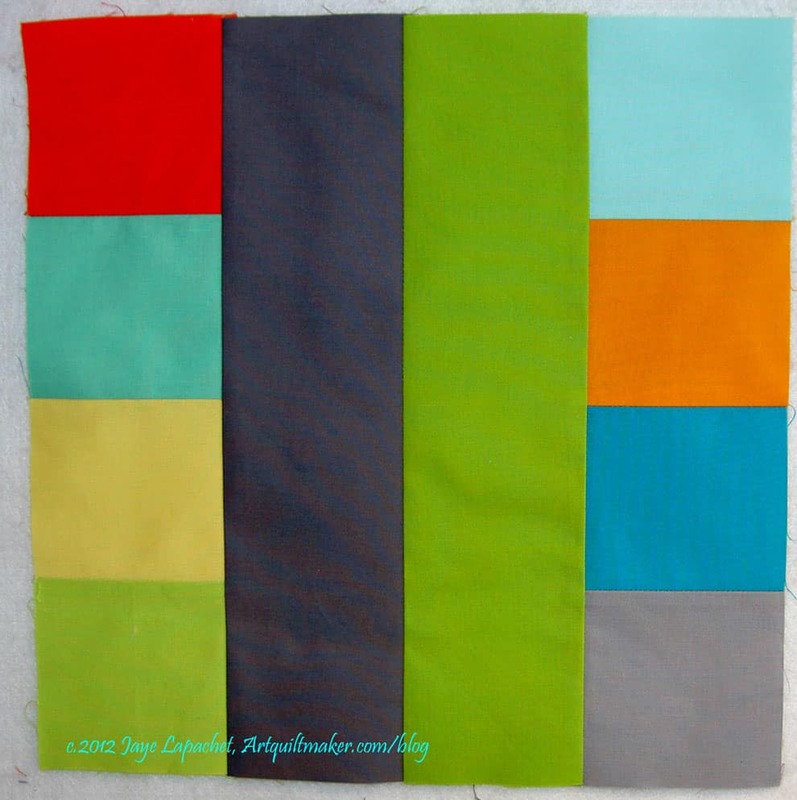 Nancy Zieman had a guest blogger talking about The Quilt that Build a Library. One block +$5=a library. Do your part! I made a block and sent it off. Yes, I used the same fabric I bought for the QuiltCon block challenge. I had plenty and it was at hand. After I made the columns, I thought I should alternate, but then I realized I put the greens and greys in the wrong locations and if I alternated the squares and rectangles, some of the contrast would be lost, so I left them. I hope the group likes the block. The information for size, where to send, etc can be found directly on the Princeton, Wisconsin Public Library website. This project goes on through 2013. I may do more and I got a lovely comment on my blog from the director of the project filled with praise for my blog, the block and my writing. We’ll see how many more blocks I make. Did you see the new studio that Olabelhe created out of her (his??) dining room? It was being pinned all over Pinterest at the beginning of June, because it is fabulous. It is fresh, clean, uses wonderful colors. Love it. You know I go on and on about developing a creative habit. Part of my solution is responding to the Creative Prompts I post on Fridays (most recent). I am not making this up. Creativity and developing a habit that allows you to call upon it at will is important. At work I get an emailed newsletter called HBR Management Tip of the Day. These are very short tips, literally taking 30 seconds or less to read. Normally, they are things I already do or know about. I was surprised to find one pop up about creativity. The tip was related to work, but I was reminded how a creative habit can help in various aspects of our lives. One of the tips within the tip (a subtip?) was “Let your mind wander. Studies show that day dreaming stimulates a unique mental state. You’ll connect dots in new ways when you allow your mind to roam.” Work or quiltmaking, it applies. I finally went and watched an episode of The Quilt Show. I am so engrossed in audiobooks at the moment that I never seem to get to them. I would suggest that you watch episode #1013 with Susan Shie (pronounced shy). Yes, you will need a membership, or, perhaps, you can just buy that one episode. She talks about creativity and how to just do it, that your work is always good enough and to reclaim that 6 year old who wasn’t worried about what others would say. I really liked this episode and it gave me a creative shot in the arm. Susan does great work, which was an added bonus. Lisa Call posted an interview about how she works. I love the reading these types of posts, because I like to compare them to what I do and think about the differences. Lil Sissy is posting to her blog from Paris and I had to update some stuff for her. While I was nosing around, I noticed one of her links, Weekly Gratitude. The project was a one year project, but the closing post is really good. The author talks about how she will continue to practice gratitude and try to look at life from that angle rather than from the negative. I think that doing a project and then doing a “project wrapup” is a great idea. Many times work projects have this step built in, but we, as creative people, sigh with relief when a project is done and move on. This is a post that I might print as a reminder. Take a look and tell me what you think. 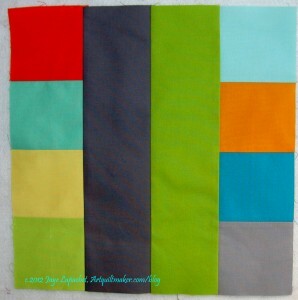 Have you seen Pam’s Pinwheels and Patches baby quilt? It is really pretty. Not in a sickly sweet baby kind of way, but in a sophisticated English Garden Party kind of way. Go take a look. A librarian friend was laid off at the beginning of the year after 20+ years of service. Needless to say the library is going to hell in a handbasket and my friend is thriving. She is looking for a new job, but she has a bit of leisure because she got severance. She is really beefing up her knitting and dyeing. If you want to buy a gift, take a look at Marlowe’s Etsy Shop. My sister put up A Day in the Life post on her blog. The post confirmed for me that we are actually related. Her day is like a lot of my days: crammed full of tasks that I just do one after another. Sigh. What a pain. I am sorry for the problem. taking longer to heat up and not getting quite as hot, and I find I was really right.hotHappy pressing! I also got fed up with my iron and went looking for the best. I almost bought a reliable digital iron but in the end just couldn’t justify paying $140 for an iron. I know how you feel. Since I can’t use the Joann coupon it is very hard to justify the cost. I can buy at least 4 new irons for the price.